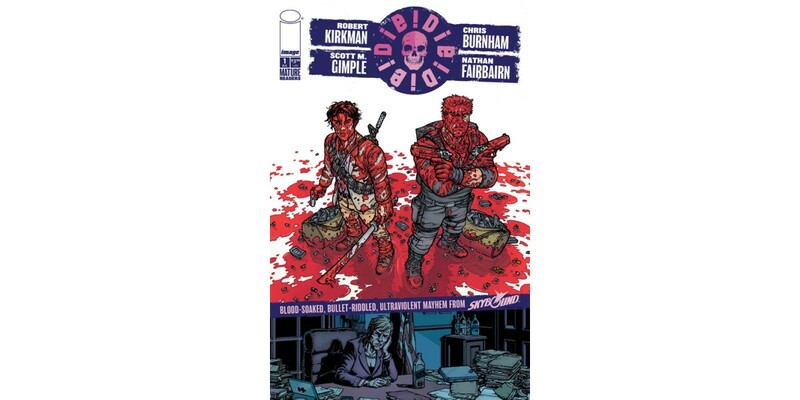 In a shocking move, Image/Skybound Entertainment dropped the first issue of an all-new series by comics titans Robert Kirkman (THE WALKING DEAD, OUTCAST BY KIRKMAN & AZACETA, OBLIVION SONG), Scott M. Gimple (Punisher: Nightmare, writer and producer for The Walking Dead TV adaptation on AMC), and Chris Burnham (Batman Incorporated, NAMELESS, NIXON'S PALS, OFFICER DOWNE), with colors by Nathan Fairbairn and lettering by Rus Wooton, titled DIE!DIE!DIE! which will be available for sale tomorrow. PORTLAND, OR, 7/10/2018 — In a shocking move, Image/Skybound Entertainment dropped the first issue of an all-new series by comics titans Robert Kirkman (THE WALKING DEAD, OUTCAST BY KIRKMAN & AZACETA, OBLIVION SONG), Scott M. Gimple (Punisher: Nightmare, writer and producer for The Walking Dead TV adaptation on AMC), and Chris Burnham (Batman Incorporated, NAMELESS, NIXON'S PALS, OFFICER DOWNE), with colors by Nathan Fairbairn and lettering by Rus Wooton, titled DIE!DIE!DIE! which will be available for sale tomorrow. "That's right, in stores TOMORROW! We want to make going to a comic shop exciting again—a place for discovery! The internet has drained all surprise and anticipation from comics. Everyone hears about exciting new projects and then has to wait months or years for it to be in their hands... and half the time at the end of that buildup, the stories get spoiled in some lame attempt at getting wider media attention," Kirkman dissed. "So, surprise! Here's a new monthly series. How cool is that?! This is literally the only way I can be like Beyoncé." “We cooked up all sorts of great action sequences and horrific gross-out gags for this book,” said Burnham. “Maybe we should have called it Puke!Puke!Puke!"